Man Steals $196k Car from Valet Service on Abbot Kinney - Yo! Venice! Update: NBC adds that it happened outside of FEED Body and Soul and that the car belonged to FEED owner DeAnna Staats. A valet parking attendant on Abbot Kinney left an unoccupied car running yesterday when a man entered it and drove away. 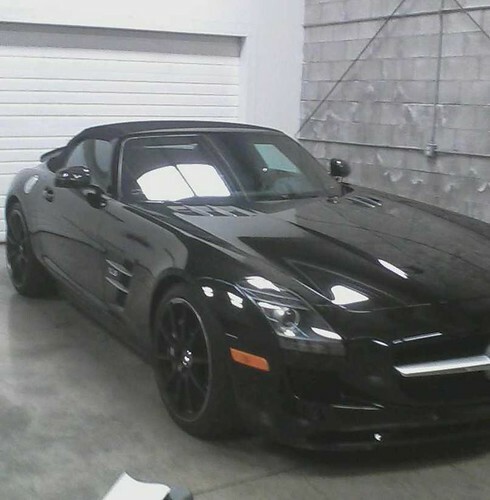 The car, a $196k (MSRP) Mercedes SLS roadster, was tracked using OnStar to Van Nuys and then Arleta, where LAPD officers arrested twenty year old Dylan Coffey while in possession of the vehicle. Patrol officers found a stolen Mercedes Benz SL5 in the Arleta area yesterday, July 30, about three hours after it had been taken from a valet service at a Venice restaurant on Abbot Kinney Drive. The suspected car thief was arrested after he tried to evade officers and entered a house, donned the resident’s clothes, and tried to feign involvement. Officers booked Dylan Coffey, 20, for burglary for entering the house in the 13500 block of Reedly Street. The car was taken during the lunch hour by a man who entered it without permission when a valet left it running for the owner. It was reported stolen immediately and the OnStar system was activated. Patrol officers from the Van Nuys Area picked up the ping around 3 PM and tracked the car to Arleta, near the VFW hall at Crowley and Astoria Streets. Officers watched the empty car for a while, then saw Coffey approach it. “Something spooked him and he went into the VFW hall where detectives entered,” Lt. Vernon explained. Coffey left the hall then jumped a fence into a residential area to avoid the police. He entered a home and dressed in the owner’s clothes, then hid under a woodpile. Police arrested Coffey and recovered the Mercedes. “The owner was happy to hear her car was found, none the worse for wear, and we promised her we wouldn’t dirty the interior with print dust,” Vernon added. at (818) 838-9977. Anonymous tips can be called into Crimestoppers at 800-222-TIPS (8477), or by texting 274637 (C-R-I-M-E-S on most keypads) with a cell phone. All text messages should begin with the letters “LAPD.” Online tips may be placed at www.LAPDOnline.org, click on “webtips” and follow the prompts.